[arc episode] An old flame of Talia's from Psi Corps, arrives at Babylon 5 with a warning. Meanwhile, G'Kar warns Sakai away from her job job at logging mineral deposits on Sigma-957. "Let me pass on to you the one thing I've learned about this place. No one here is exactly what he appears. Not Mollari, not Delenn, not Sinclair… and not me." - G'Kar: I have just picked it up on the tip of my glove. If I put it down again [replacing the ant on the flower] and it asks another ant, "What was that?" …how would it explain? There are things in the universe billions of years older than either of our races. They are vast, timeless. And if they are aware of us at all, it is as little more than ants…and we have as much chance of communicating with them as an ant has with us. We know. We've tried. And we've learned we can either stay out from underfoot, or be stepped on. G'Kar: Yes. They are a mystery. And I am both terrified and reassured to know that there are still wonders in the universe…that we have not yet explained everything. Whatever they are, Ms. Sakai, they walk near Sigma 957. They must walk there alone. -"Anatomically impossible, Mr. Garibaldi. But you're welcome to try." -"The Psi Corps is dedicated to one thing: control. Control over telepaths, the economy, the courts, over matter, over thought itself." -"Good-bye commander. I will see you again, in a million years." -"Narns, humans, Centauri, we all do what we do for the same reason: because it seemed like a good idea at the time. " - "Good ol' Psi Corps. You never cease to amaze me - all the moral fiber of Jack the Ripper." -Telepaths have very intense love affairs, as a side effect of telepathy. -Psi Corps keeps a very tight leash on all human telepaths. -Telepaths are ranked (mentioned briefly in the first episode). Talia's mid-rank (a P5). Trainers are P10. Bester and other psi-cops are 12. Ironheart had jumped off the chart due to what Psi Corps did to him. -Telekinetics are rare, extremely powerful, and tend to be completely mentally unstable. -Psi Corps is engaging in illegal experimentation to increase their power. Specifically, they want telekinetics who can control small things extremely precisely. -Ironheart's parting gift: making Talia telekinetic. -Sakai has a new job, scanning Sigma-957. G'Kar tells her it's a bad idea. She goes anyway, and almost dies when something huge, and unlike anything she's ever seen, bumps into her. She is saved by Narn fighters. Also, note that Ivanova, noted anti-telepath, is the one to hand a distraught Talia some water. Ivanova hates what Talia stands for, but she's compassionate. Okay, back in Infection, I alluded to another episode coming up that had even cheesier bits than Infection, but was also much more arc relevant. This is that episode! I can see what they were trying to do, and a lot of it works very well, but the ending bit just makes me think of that Expanding Brain image macro, and not in a good way. Then again, I think that's a failure of visual storytelling to live up to the ambitious concept, which is at least an interesting failure! -Introduction to the Psi Corps. Bester is very much the guy you love to hate, right? I feel like you can start to see the evolution of the VFX team here. It's been a couple of weeks since I watched this so I may be misplacing things, but I've noticed a few new VFX shots that looked several notches nicer than what we saw in the first few episodes, in terms of lighting particularly. Not sure if that's my imagination or not, but it's interesting! i liked the actress who played catherine sakai. Bester is very much the guy you love to hate, right? I consider Bester one of the finest villains in TV SF, and definitely my favorite work by Walter Koenig. I had missed that detail, but feel it may be important later. This episode is truly notable for giving G'Kar, previously portrayed as something of a heavy menacing Molari, a completely different aspect. It foreshadows a lot of character changes to come. The ending visual I don't think ever landed in the way they wanted...but the idea that G'Kar expressed at the end was what sold me on this show. That there were some mysteries in this universe that weren't necessarily going to be explained was an idea that I really liked, since Star Trek (which I also love) was always biased in the other direction - everything was explained and wrapped up by episode's end. And having G'Kar behave in a somewhat unexpected manner just underlines the other point of the final scene - nobody on the station is what they appear to be. It was a fantastic bit of casting. Koenig is great as Alfred Bester (named for the SF writer), and it was nice to see him outside of the role of Chekov. >I consider Bester one of the finest villains in TV SF, and definitely my favorite work by Walter Koenig. It was a fantastic bit of casting. Koenig is fantastic as Bester, and Bester is fantastic as a believable villain: I do so love the closing scene of this episode, with his protestations that Sinclair's proposed reporting would be 'a lie,' and the layers of implication back and forth. Meta-notes, on that note: Bester's imaginary hat-tip and farewell 'be seeing you' to Sinclair is nod to the 1960s surreal psychological thriller The Prisoner, a show with a repeated focus on the intersection of surveillance and paranoia, which -- well, that's Bester for you. Casting-wise, Koenig was almost cast for a different (and one-off) role in an upcoming episode, and had to decline due to health and timing; Patrick McGoohan -- of The Prisoner -- was then offered that role (not Bester's), and ended up declining because of timing constraints in filming. I'm not sure, offhand, if there was someone else in line for Bester's role before Koenig, though. There's a lot here that I'd say if this wasn't a first-watch for some folks -- there's plenty of forward-looking relevancy; instead, I'd note that this is (as noted) an episode where the actually-pretty-cool-for-its-time-CGI hasn't held up well, unfortunately. Casting back to the procession of ceremonies and beliefs previously, G'Kar's interest in the material-but-unknowable things of the universe is striking here: he both believes in and revels in unknown mysteries, but in concrete mysteries -- in things that do exist and yet are unexplained, rather than in things that may or may not exist. It's a welcome deepening of his character. I think a weakness of the first season is that you don't get to meet the mystic G'Kar until several episodes in. 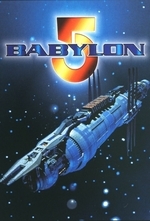 Babylon 5 does play the long game in terms of bringing out the hidden depths of both G'Kar and Londo. I rank them as two of the great tragic characters of SFF cinema.